Hey, lovelies! It's Birchbox time! My September box came in the mail yesterday and for this one, Birchbox included a few essential items that are just perfect to jump-start us into the fall. 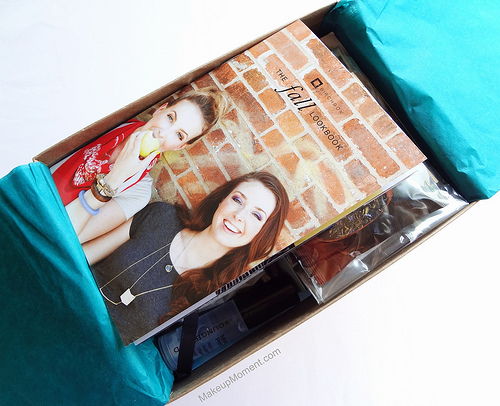 The first thing I noticed in the box was a look book that was filled with loads of fall makeup, hair, and fashion tips and trends. Super fun, and inspiring too. Let's take a closer look at what was inside my box this month! Color Club Birchbox Custom Polish in Status Update: Birchbox teamed up with Color Club to create a few custom Color Club nail colors, which are just absolutely stunning and so perfect for the fall. I received a mini sized one called Status Update-a murky, dark grey cream. I am glad I got this color because I don't believe I have anything like it in my collection. I will be sure to do a nail of the day post, showcasing swatches of this beauty, soon. 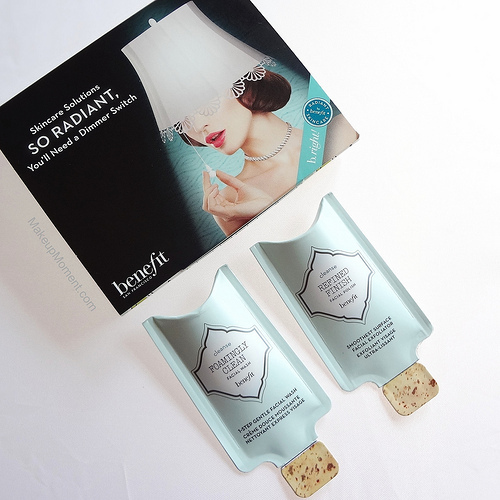 Benefit Cosmetics Foamingly Clean facial Wash + Refined Facial Polish: I have been wanting to try a few of Benefit's skincare products so it was nice to see these two in my box. The facial wash contains a gentle formula that helps rid the skin of dirt and impurities, without drying out the skin. And the facial polish is infused with detoxifying clay and seaweed extract, which absorbs excess oil and clean out pores. They both sound great and I can't wait to try them. 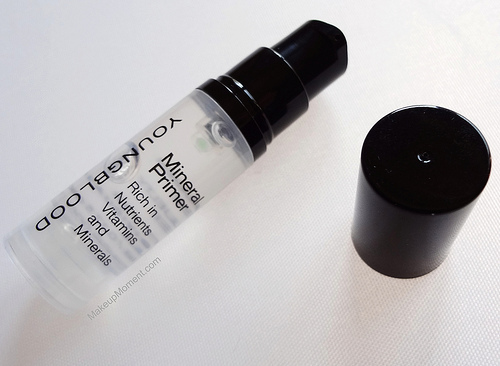 Youngblood Mineral Primer: It's been ages since I last used a face primer. I have always thought them to be an extra, unnecessary step in my routine, so I eventually fell out of the facial primer bandwagon. To be honest, I am looking forward to trying this one, though. This primer contains soothing vitamins, minerals, is paraben free, and cruelty free, too. Who knows? I may get back into the habit of face primers again, if I like this one enough. I really appreciate the size of this sample. But what really wins me over is the fact that the sample tube contains a pump. 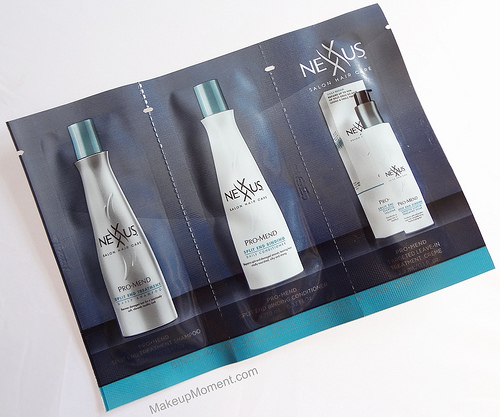 Nexxus Pro-Mend Split End Treatment System: I remember loving Nexxus hair products a few years back. I don't know why I ever stopped using them? This trio of sample packets consist of a shampoo, conditioner, and leave-in treatment, that helps repair and bind split ends back together. Sounds pretty interesting. The packets feel jam packed with product so I am sure that I can get 2-3 uses out of each of them. 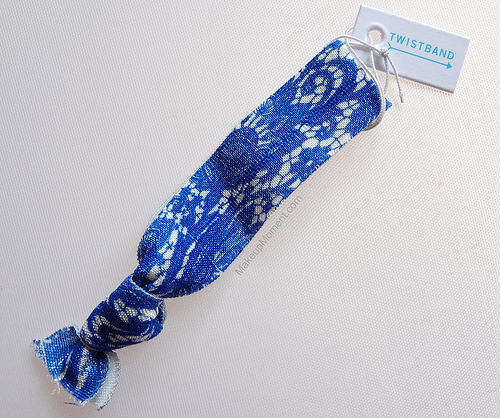 Twistband Birchbox Custom Lace Hair Tie: I always get excited when I see one of these twistband hair ties included in my box. This is my third one and the pretty blue color along with the lace print is so fun. I like these hair ties because they don't pull or snag on my hair. They don't leave behind a dent either, which is a major plus. These are the gentlest hair ties I have ever encountered. Love them! 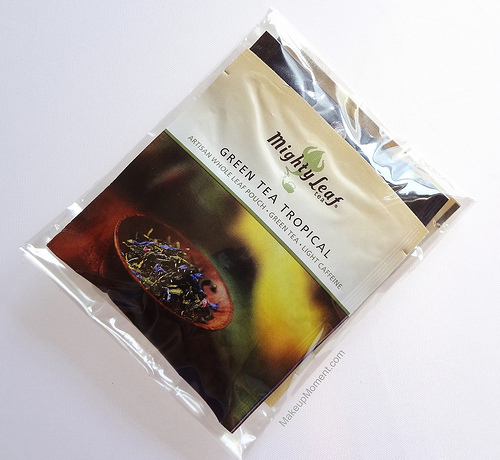 Mighty Leaf Tea Company Teas: I love teas and these Mighty Leaf ones look amazing. I received three different varieties-Green tea Tropical, Chamomile Citrus, and Vanilla Bean. They all sound delicious. I think I am going to sip on one of these, tonight. 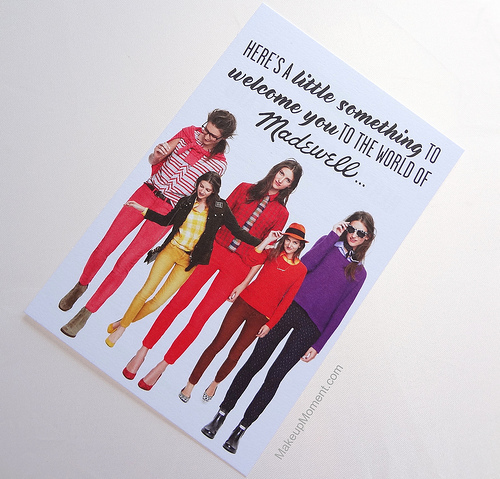 Madewell $25.00 Gift Card: This Madewell $25.00 gift card (off a purchase of $75.00 or more) was a nice touch. There is Madewell store here in New York City so, I will probably go check out their fashion offerings one of these days. I hope to find some great pieces. Overall: I also want to mention that aside from these items, there was also a digital download pass to download two of singer-songwriter, Tristan Prettyman's tracks. I am pretty pleased with all of the products I received in my box, and I will definitely be putting all of them to good use. 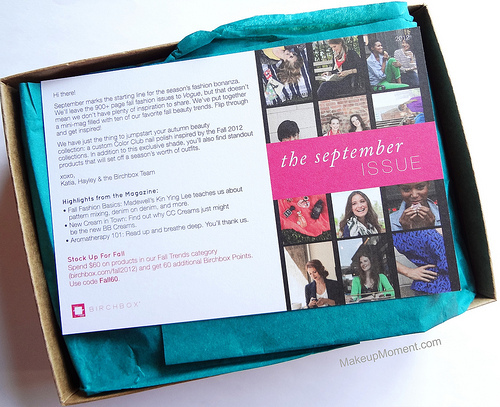 I can't wait to see what Birchbox has in store for us in October! If any of you are interested in signing up for Birchbox, you can sign up through my referral link if you'd like. What do you all think of this month's Birchbox? Disclaimer: I am not affiliated with any of the companies mentioned above. I purchased a monthly Birchbox subscription for my personal use. If you sign up using my referral link, extra Birchbox points will go into my account that are good towards future purchases in the Birchbox shop. 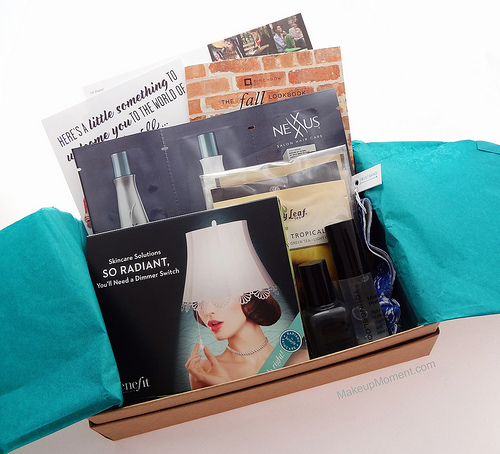 I always get so jealous when I come across any Birchbox posts since they all seem so amazing. I wish that we had it in Canada. Even though I do enjoy a majority of our beauty boxes none of them compare in terms of the themed boxes that Birchbox has! Mine should come in today! Yours looks pretty good, the Benefit skincare and the YB primer look like fun. I don't like the ponytail holders, they don't do much for my long thick hair. But I can see why other people would like them. Thanks for sharing! No problem, Kayla! Glad you enjoyed :) I can't wait to see what you get in your box! My nail polish says "Uptade" on the bottom!